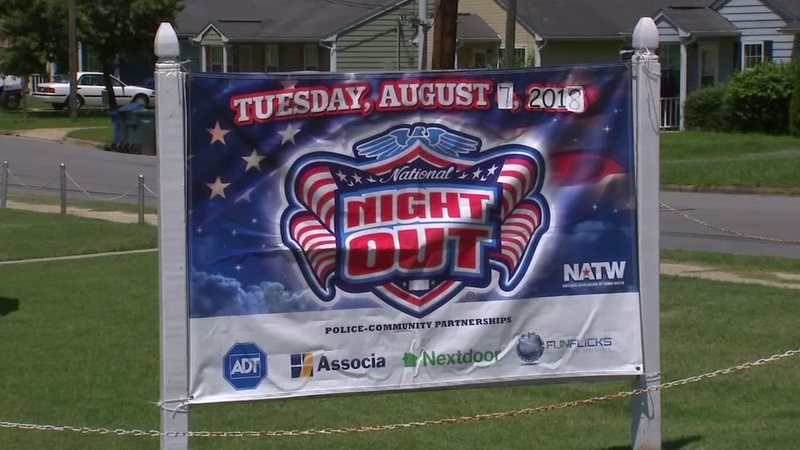 August 7 is National Night Out. RALEIGH (WTVD) -- Roger Shipman grilled burgers in preparation for the annual National Night Out gathering at the Cedar Moor Apartments in Raleigh. The maintenance supervisor at the apartment complex said he believed the event has led to a decrease in crime in the neighborhood. "It brings everybody together and the crime rate in this community, that I know of, has gone down a lot in the last five years so it's been a tremendous help to us," Shipman said. Raleigh Police Sgt. Rich Marx said there are about 45 National Night Out events in the city on Tuesday. He said it brings the community together and neighbors can interact with police. "The hope is that by building relationships people will feel comfortable calling us, calling 911, or even if they're not, going to a site like Crimestoppers and they can be anonymous on that site," Sgt. Marx said. Durham Police spokesman Wil Glenn said there are over 100 sites in Durham hosting National Night Out gatherings. He said it's about police-community relationships, neighbors getting to know each other and the city as a whole having a night to stand firm against crime. "I think there's certainly an impact anytime you can go out in your neighborhoods and first of all, get to know your neighbors," Glenn said. "We need our residents to help us, keep our communities safe so if you know each other, you're talking, you see any suspect, let us know. It definitely makes an impact long term." Glenn said the events also allow the community to relate to officers. "It's a party so (officers) may be doing the wobble or they may be eating a fish sandwich," he said. Dr. Shaneeka Moore-Lawrence is one of the organizers of the event at Greater Waltown United Holy Church in Durham. They're expecting at least 300 people. "I would say in our community at times there's a negative connotation associated with law enforcement and we see that this event allows our neighbors and those who reside in this community and other communities that come to our event to see the police in a very comfortable setting," she said. It's the 35th Annual National Night Out- America's Night Out Against Crime.